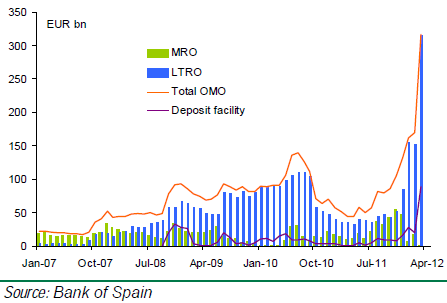 Here is a follow-up (based on a recent report from BNP Paribas) to the earlier post discussing Spain's banking system and its linkage to sovereign debt. First of all one of the major reasons the banking system is in trouble has to do with an unparalleled bubble that existed (and to some extent still does) in Spain's real estate markets. 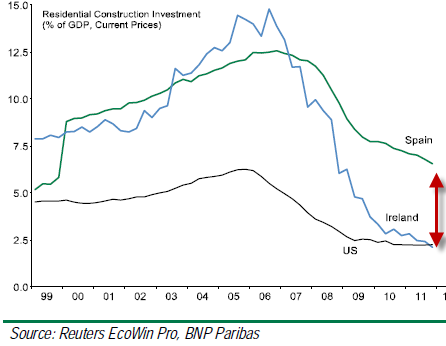 Spanish banks continued to fund developers to a much higher extent than other nations that also experienced a housing bust, namely Ireland and the US - even after 2009. 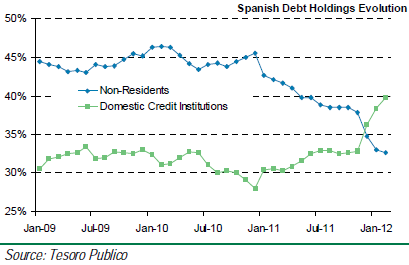 ... to buy Spanish government debt. That increased the proportion of sovereign debt held by domestic institutions vs. foreigners. Now you have a banking system that needs a bailout even if the government bond holdings are in good shape. Should there be some form of Spanish sovereign bond restructuring, the amounts required to recapitalize the banks would be astronomical. BNP Paribas: - What looks really worrying though is the decreasing share of foreign investors and the potential continuation of not reinvesting the maturing bonds. Don’t forget, as the Greek PSI clearly demonstrated, that in the unfortunate case of a restructuring in Spain, the higher the holdings of domestic bonds by the domestic banks, the higher the need for recapitalisation funds, and therefore the higher the required haircut of that restructuring in order to hit the final debt reduction target. Clearly we are a long way from any sovereign restructuring talk, given that Spain's debt to GDP ratio is still better than the EU as a whole. But the state of the banking system and the amount of sovereign debt held domestically points out how disastrous such a restructuring could be for the Eurozone.